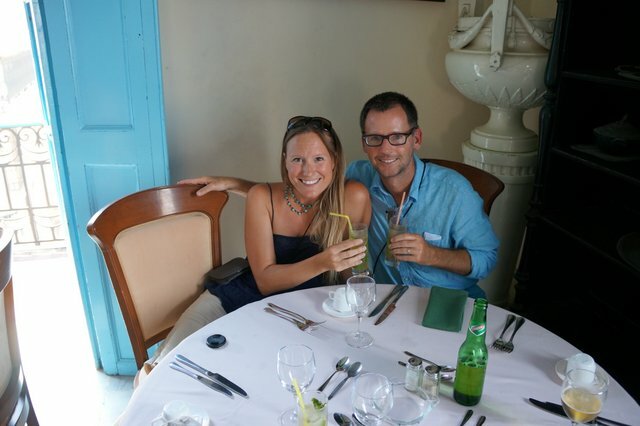 InsightCuba caught up with David and Shelley Kuczkir, a quirky couple from Charleston, South Carolina, following their trip to Havana with insightCuba. After having set their mark on the sunny climates of Australia, New Zealand, the Caribbean islands and Hawaii, they decided it was time to take a leap of faith and visit Cuba. InsightCuba: Who are David & Shelley? David Kuczkir: We are spur of the moment, enthusiastic world travelers who LOVE new experiences and making new and lasting friendships. Shelley is a wealth manager and I’m a CPA who practices ardently at being the next Great American Novelist. Shelley and I have been itching to go to Cuba for years, and it was our wish to go before the embargo ends. Shelley’s background is in theatre and I couldn't be quirkier. Before our trip we thought it would be fun to roll play pretending to be Hemingway and Gellhorn for a whole weekend. We were having so much fun that the lines got blurred more than once. When we were planning our Cuba trip there was only a handful of licensed tour companies offering people-to-people tours. We picked insightCuba because they have a great track record, and the staff was friendly and eager to answer the ton of questions we threw at them. They also were the only ones offering the Weekend in Havana. Mind you, we traveled last June, tumultuous times in terms of US and Cuban relations, so getting our feet wet was right up our alley. One of the most memorable parts of our trip, for me anyway, was meeting a renowned Cuban scholar who talked to the group for an hour on just U.S.-Cuban policy. To hear Cuba’s side for once, and to hear it from such a respected author and expert on the subject, certainly added a new perspective. He reminded me that there are always two sides to every story and what you read and see on the news is not always the truth. Why Cuba and what did you like most while there? Cubans are Resolvers. I read that somewhere once. I never fully understood what that meant until I saw Cuba with my own eyes. Nothing goes to waste in Cuba. I remember the bus ride from the airport to Havana vividly because at one point I remember thinking, I want to go home. Where was all the beautiful architecture and the Malecón, the five mile expanse of seawall, and the 1950s American cars? The ride was our induction to the fact that we were now in a third-world country. As we approached Old Havana both the seascape and the cityscape changed dramatically, and for the better. The architecture was absolutely stunning. We couldn’t take our eyes off all the Colonial and Baroque and Neo Classical buildings all around the beautiful seaport city. And classic Americana was everywhere on the streets too. Just as I had pictured it would be. It all gave us a sense of home and quick lesson on how deep and intertwined the connection is between U.S. and Cuba. The food exceeded our expectations. After five o’clock you are off the government’s clock. We explored every nook and cranny in Havana until our feet ached. Every night we ate at paladares, privately owned restaurants operated in peoples’ homes. The food is worthy of five stars. We devoured tasty dishes like grilled octopus and papaya lasagna. For the record we are not cigar smokers. Fortunately for us, Cuba produces the best coffee and rum in the world. You better believe we indulged. Advice to prospective travelers to Cuba? Go before the embargo is lifted. And eat at La Gaurida. Every new day brings the US and Cuba closer to normalized relations. For the Cuban people, the Resolvers, I hope tomorrow is that day.